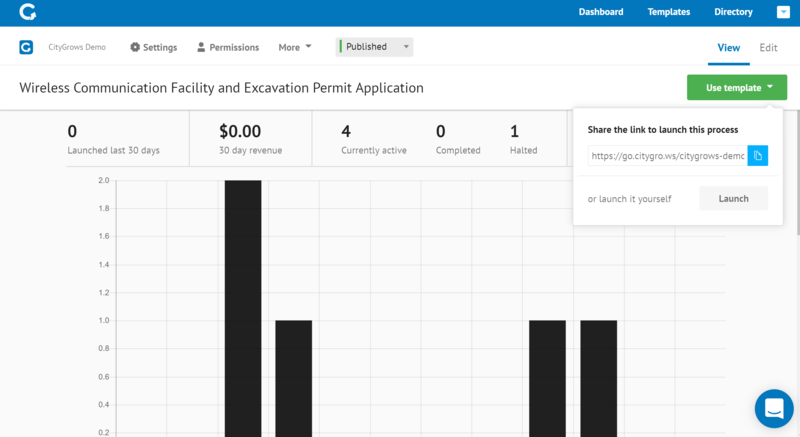 There are two different ways to launch a CityGrows process as a government employee/ administrator: internally via your dashboard, or externally (the way a constituent or business will) via a link or your organization's public portal. Some governments use CityGrows for internal processes like employee evaluations or routing of agendas - these types of processes are usually launched by employees/ admins. And it's important to launch and test any of your processes before you share them with the public. There are two ways to launch a process internally. You can click the "Launch" option once you click the green "Use Template" link. If the process is set to "private", it will only be launchable by users who are already set up as admins (and the same is true for processes that haven't been published). When you're ready for the public to start using your template, you can make it live by adding the unique process link to your website or social media.